I missed last week's Yarn Along post in the frenzy of Easter and a family night at school and honestly, not much knitting was done last week. I'm trying to catch up on it this week. As you can see, my Nimue wrap is coming nicely! There are 25 repetitions of the pattern and I have done 18 so I am not far away now. Unfortunately, I also realised that I have FOUR babies being born in our circle of friends in the next few months, May, June, August and September. I know it's a tall order and I probably won't get a blanket done for everyone but I am going to try my best! 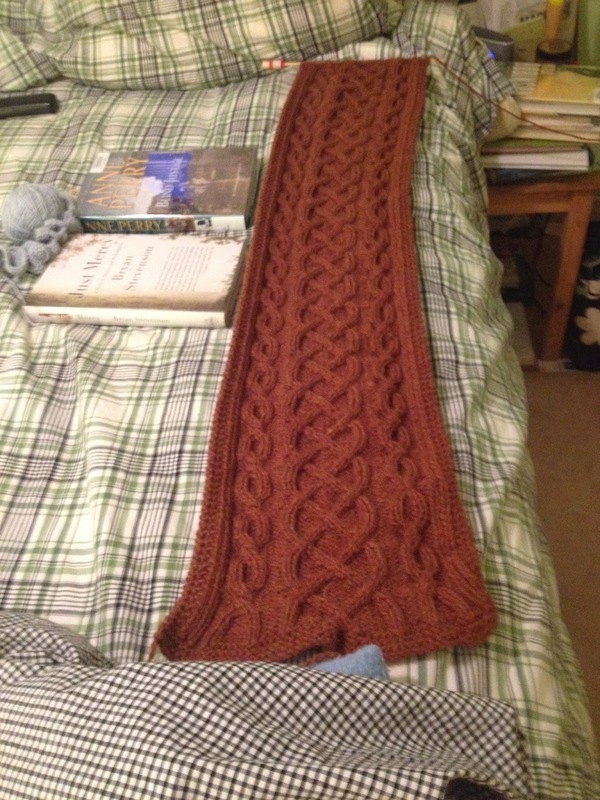 I spent some time of Ravelry searching out patterns and tried to find some that would do. I'm going to start with the most basic - a version of a feather and fan. I had trouble finding a good yarn but I ended up with this lovely grey-blue shade of DK. I don't know whether this baby is a boy or a girl but given that my LYS didn't seem to have all that much of anything, I thought this combo was safer than anything else. I started last night and it's beginning to show some progress but I wasn't paying enough attention earlier today when I tried to sneak in a few rows and I had to tear out - UGH! In terms of reading, I finished Found by Micha Boyett (LOVED, LOVED, LOVED this book and will try to write a post on it later on this week) and I also finished The Handsome Man's De Luxe Cafe, finally (I didn't enjoy it as much as some of the other books by Alexander McCall Smith. 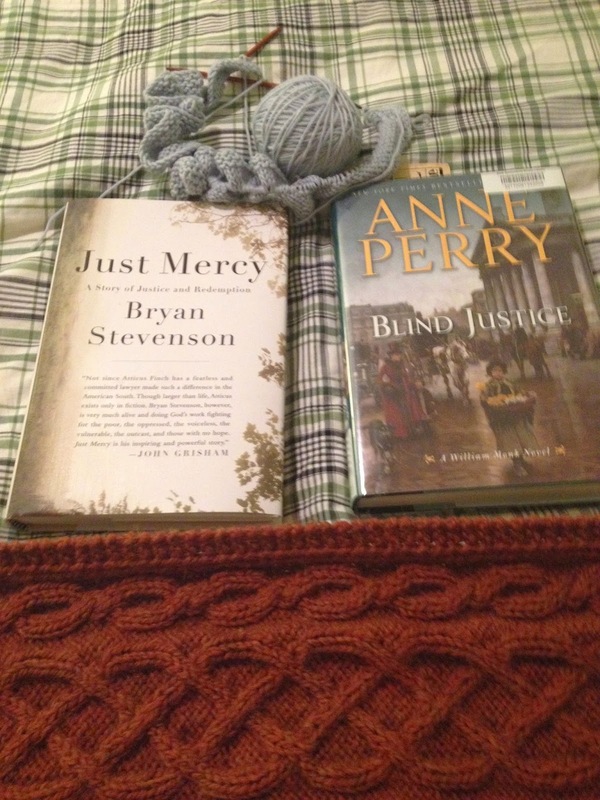 Now, I'm reading Blind Justice by Anne Perry (which I hope to finish tonight) and Just Mercy by Bryan Stevenson. Blind Justice started out slowly and I wasn't sure that I was going to enjoy it but, as so often happens with the Monk series, we are now embroiled in a tense court case and I'm hooked - I MUST find out how it gets resolved. Just Mercy is a huge shift. It's this month's featured book for the Red Couch book club at She Loves and it's the autobiographical exploration of the career of Bryan Stevenson, who works as a lawyer supporting death row inmates in Alabama. I started the book during Easter and ended up sneaking off to read over and over again. I have pretty strong feelings against the death penalty and this book is grabbing me, much the same way that Dead Man Walking grabbed me many years ago. This is a thoughtful exploration of the humanity of even killers on death row and the fact that there are many factors that go into creating a killer and that it is wrong for the state to murder its citizens, no matter what they have done. I can't recommend this highly enough! I can't wait to see what everyone else is working on, bookwise and on the needles!